Inventory We are a resale marketplace, not a box office or venue. Ticket prices may exceed face value. This site is not owned by Spectrum Center . The Spectrum Center, formerely the Time Warner Cable Arena, is an entertainment and sports venue located in the Uptown (downtown) area of Charlotte, North Carolina, USA. Its primary use is as the home court of the Charlotte Bobcats of the NBA. It made its grand opening in October 2005 for a concert by The Rolling Stones and hosted its first Bobcats game on November 5, 2005. The arena's center-hung Daktronics video screens measure 16 feet by 28 feet, making them the largest of any indoor arena. 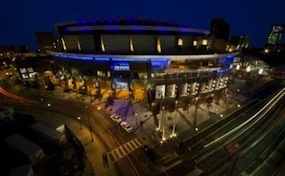 The arena is owned by the city of Charlotte, but operated by the Bobcats. It is also currently the 2nd youngest arena in the NBA to the Orlando Magic's new arena, Amway Center. Center-Charlotte.com is not affiliated with any primary box office or supplier. We are a privately owned and operated business specializing in sales in the secondary resale market. To buy tickets for any Spectrum Center events in Charlotte simply click on the event of interest or call our operators at anytime.